A quick little recipe that is AMAZINGLY delicious! 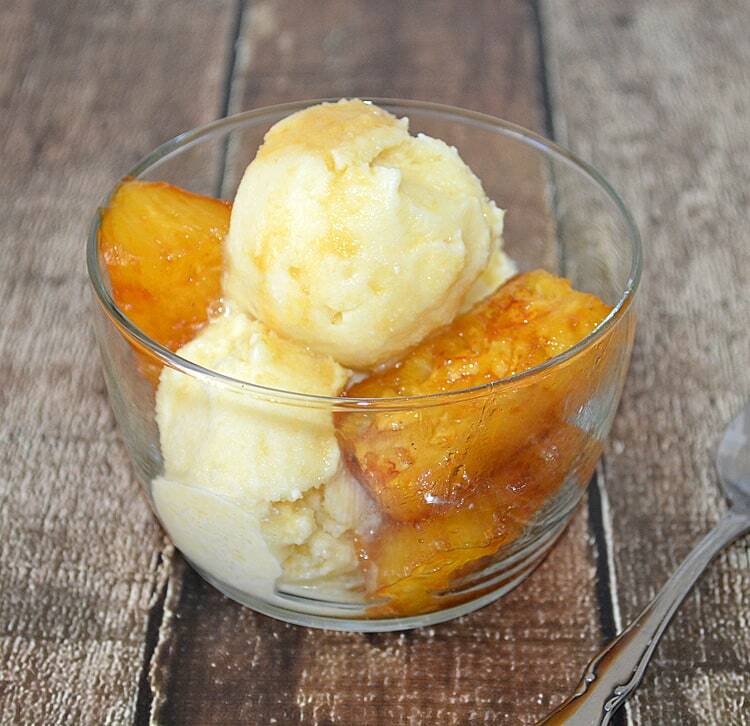 Pineapple Coconut Ice Cream with Caramelized Pineapple. Now, you could do just the ice cream and believe me…you will be very happy. However, adding the caramelized pineapple just adds something to it. 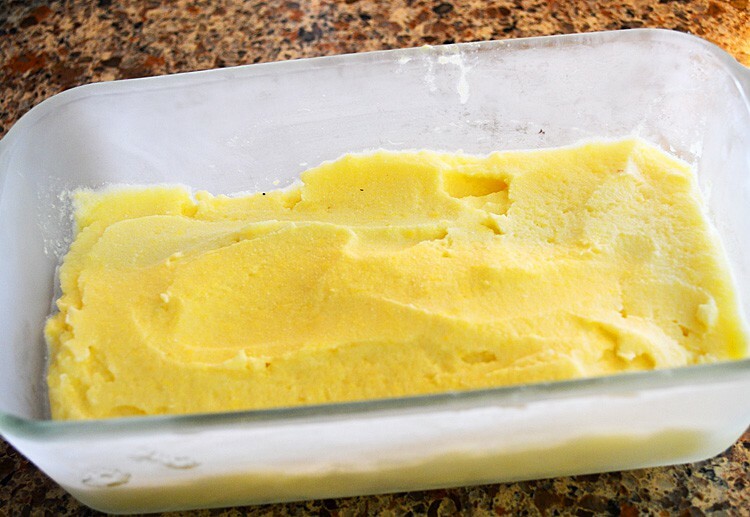 This ice cream recipe makes enough for 4-6 people. And, did I mention that it only uses 5 ingredients? Pineapple, coconut milk, coconut water, vanilla and agave syrup. It’s just that easy! 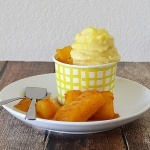 Even easier, the pineapple is dipped and lightly coated in sugar and saute in margarine until the sugar caramelizes. It’s sooo good! A word of caution, this sugar is HOT! Be very careful to let it cool before using it. Just before removing it from the pan, we added a bit of water and it makes a nice syrup to top the ice cream. The night before, freeze the bowl of your ice cream maker and place the can of coconut milk into the back of your refrigerator. To make the ice cream, flip the refrigerated can of coconut milk upside down before opening. You will be opening the bottom of the can and draining off the liquid. You can use this for smoothies. Since we only use half the can in this recipe, I reserved the liquid and remaining solids for use in another recipe. Since most people don't have alot of experience with cutting a whole pineapple, I thought I'd give you a quick tutorial. Twist the top off first. Slice in half lengthwise and then quarter. Remove the core and trim the ends. Now slice the fruit away from the skin. In the bowl of a food processor, place 1/2 of the pineapple, the coconut solids and coconut water along with the agave and vanilla. Process until smooth. Pour into your frozen ice cream bowl and process according to the instructions of your particular ice cream maker. Once completed, place into a loaf pan and into the freezer to solidify a bit more. Meanwhile, slice up the remaining pineapple. In a large saute pan on medium high heat, add the margarine. Roll the pineapple slices in the sugar and place in the hot pan of butter. Try not to turn more than once or twice so caramelization is achieved. However, you SHOULD be shaking the pan very frequently so the sugar doesn't burn. 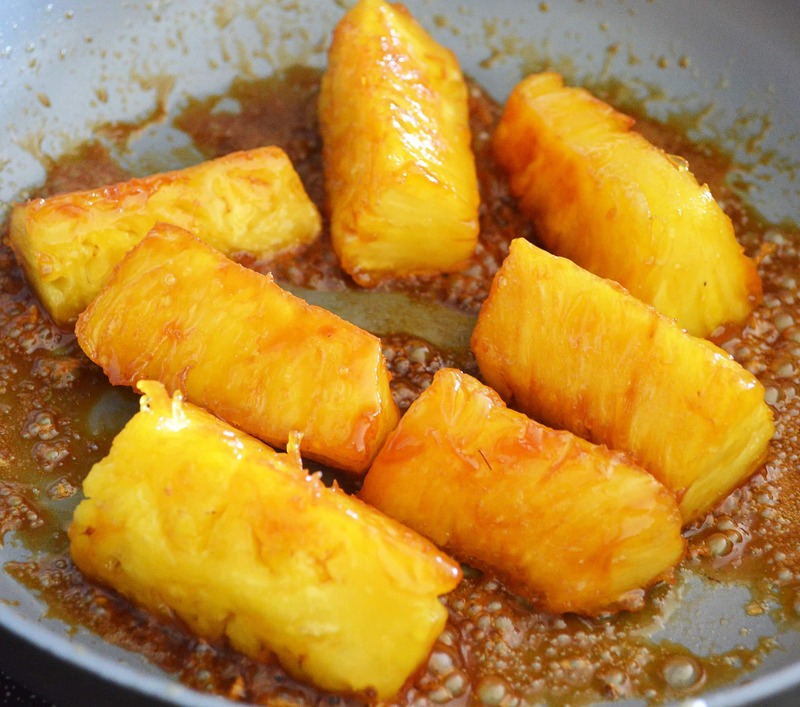 Add the water to the caramelized sugared pineapples and saute until a sauce forms. Cool for a few minutes before topping your ice cream. The sugar is VERY hot, so be careful.